ILY | What Does ILY Mean? ILY means "I Love You". Be aware that the weight of ILY depends on the relationship between the sender and the recipient. ILY became popular in 2007 on MySpace. Through its overuse, ILY should not always be taken literally. It is sometimes used just to show affection, rather than actual love. The image shows an intricate "I love you" decoration made from folded card. Person A: ILY! Thank you for the flowers. They're beautiful. Person B: Anything for you. I love you too. Person A: I fixed the image. It should be transparent now. Person B: You're such a good friend. ILY. 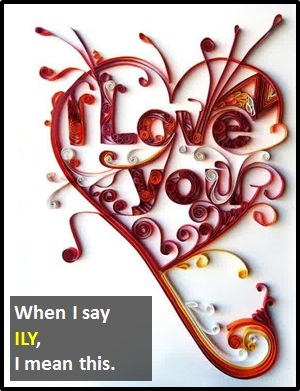 ILY is a standalone declarative sentence (i.e., a statement). Of note, ILY is an initialism abbreviation. Technically, this means it is pronounced using its individual letters (i.e., Aye Ell Why), but as this is harder to say than "I love you," it is not often uttered using its letters. In other words, the abbreviation ILY is for efficiency in writing and not efficiency in speech. Before the digital era, we would have just said "I love you" instead of ILY.